’Gabriella’ Baby Knitting Pattern. Design is based on a vintage pattern which has been re-worked and brought up to date using modern materials. An easy to knit design for a gorgeous hooded cape with a matching pair of booties. 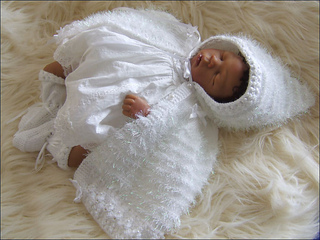 This set would make a lovely addition to a baby girl’s christening ensemble or a great cover up for a special occasion. The cape is knitted in one piece with the hood knitted seperately and sewn in place.